I haven't read the proper winners, unfortunately. Still, the Carnegie shortlist allows me to walk away with a little dignity. I've read Clay and Framed is in my to-be-read pile (though it was just usurped by naughty readable Gideon the Cutpurse). I didn't do too shabbily on the Kate Greenaway shortlist either (THREE, ho ho!). 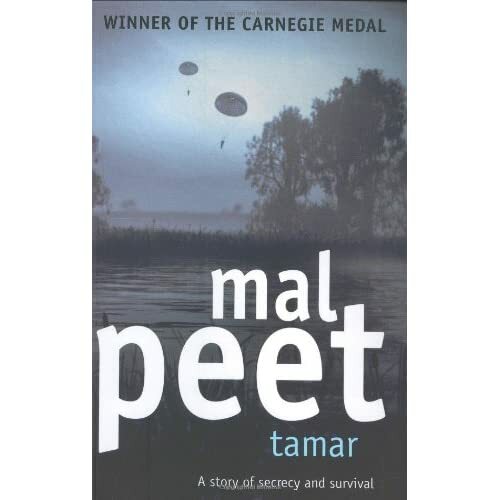 By the way, the Carnegie winner proper was Tamar by Mal Peet. Here's the problem with the paperback cover they keep using to display the winner. Take a good long gander at it. Am I alone, or does it look as if it's saying that the book is actually the equally believable Mal Peet by Tamar? Look Walker Books, I don't want to tell you how to do your job, but when you have an author with a name like Mal Peet and a book with the equally name-like word "Tamar", you need to make it clear which is which. Silly Brits. Yeah, I thought it was one weird title.